I love the faucet. Where did it come from? I'm afraid it came from a second hand store. There is no maker's mark. My brother rebuilt the gasket seats and found rubber gaskets that fit. The basket on top came from a very different fixture, a sort of soap and razor dish, which my brother modified and mounted to the stem for the original soap dish. That dish was missing, but this one is much cooler. I've been keeping my eyes open for a second pierced bowl for years now, because there's a second sink/faucet in the kitchen that could use one. My brother rolls his eyes about my Victorian Plumbing Fetish but I'm VERY lucky to have such a skilled and generous brother! 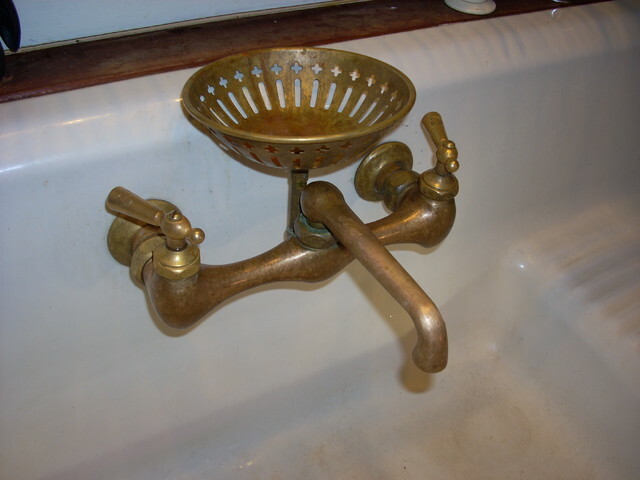 a very unique faucet. I like how the soap dish is incorporated..
We finally found the cast iron sink halfway to Portland Oregon. We had to unload the whole van to load the sink as the bottom layer. It never would have worked to put it on top of the harp & guitars! This faucet showed up several years later in another small-town antique mall. The soap dish came later still. But they came together perfectly with a lot of help from skillful friends and family.